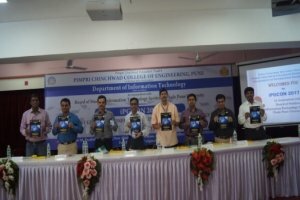 iPGCon-2017 : 8th Post Graduate Conference for Information Technology was organized on 5th April 2017 In association with Board of Studies, Information Technology Savitribai Phule Pune University, Pune. The overall theme of the Conference was to provide an opportunity for PG Students to showcase/discuss their in-progress dissertation. 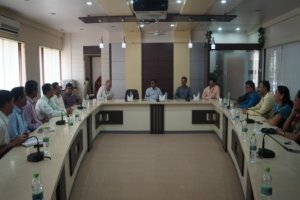 It was a conference for PG students of Information Technology to have detailed discussion with attendees/session chairs and obtain feedbacks/ critical evaluation of their dissertation work. Almost 104 students participated from ME (Information Technology) as presenters who demonstrated their project work to the panel of reviewers from various colleges. In addition to ME students, two separate tracks were organized for undergraduate students and MCA students to inculcate research components in their final year projects. All the presentations were carried out in 11 parallel tracks in the department. All the guests were welcomed by the conference anchors Mrs.Meera Thorat and Ms. Bhakti Ratnaparkhi. Opening remarks was initiated by Dr. S. D. Thepade, HoD and Convener of iPGCon 2017. Success and objectives of iPGCon was elaborated by Dr. PN Mahalle, Conference Chair and BoS (IT)-Coordinator, SPPU. Dr. A. M. Fulambharkar, Principal and General Chair, iPGCon addressed all the participants and motivated them for effective research from the projects. Mr. Atul Kahate, Industry Professional and Technical Author of many books shared his vision of innovations in academics. He stated many examples where research could be initiated. 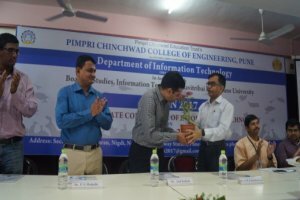 Very fruitful and interesting key-note address was delivered by chief guest Dr. Adhitya Abhankar, Dean Faculty of Technology, SPPU. All the guests released of conference proceeding and was circulated to all. The conference inauguration ceremony was culminated by vote of thanks proposed by Dr. N. J. Uke, Convener , iPGCon 2017.